I am a sucker for delicious breads and pastries... I can live alone by just having bread all day. 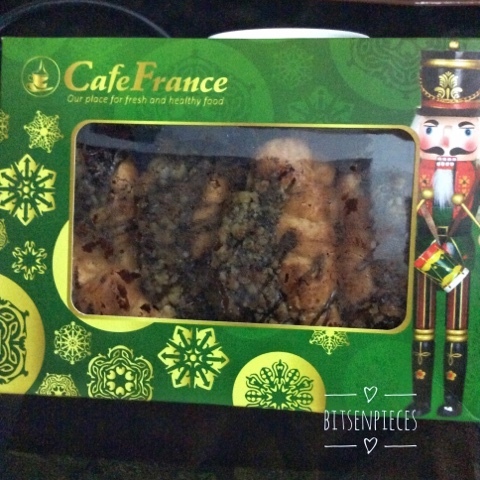 I received a box of Cafe France bread box with Christmas design and in it was pieces of chocolate walnut croissant rolls. We don't have any branch of Cafe France here in Subic that's why I was excited on what was inside when it was handed over to me. 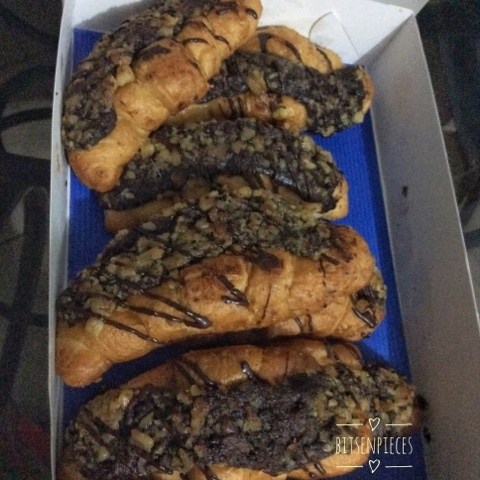 The croissant bread was light and fluffy, dark chocolate was covered the middle portion of the croissant and crushed walnuts on top plus drizzle of dark chocolate for added design. I don't have any idea how much this bread cost but it was delicious. I placed two croissant rolls in a dish pan and reheated it on the microwave oven, paired it with Maxwell medium roast coffee. Christmas started early because if the motif design of the box and it got me excited a bit. The merriest season we are all excited for. Any thoughts on this dark chocolate croissant rolls?